This week we added Cecil's character animations to the cauldron mechanic prototype that we showed you last week. We're really happy with how they turned out. The .gif doesn't really do them justice since it's only recorded at 15 fps, everything is much smoother in game especially the camera when it pans from one Cauldron to the other. 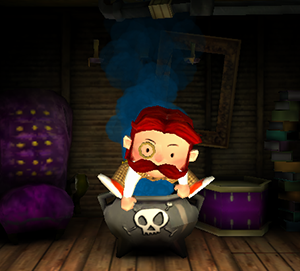 There's still one animation missing - currently the bottle just disappears when Cecil interacts with the Cauldron, we want to have the bottle fly out of his hand and land in the cauldron but we're having trouble getting the bottle's animation to bake out to the .fbx. And a still shot of Cecil popping out just for fun.